Mike Pence was a man with a mission. 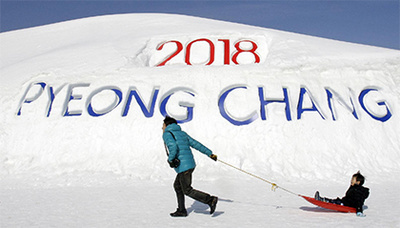 At stages through the opening parts of the Winter Olympics in South Korea, he looked like a man on a mission. With diplomatic gestures flowering all around with weedy vigour in Pyeonchang, he was intent on fighting them. The gardener of empire had his implements at the ready. He proceeded to meet four North Korean defectors. He had been in Japan announcing “the toughest and most aggressive” sanctions against Pyongyang yet, exhorting troops at Yokota Air Base to guard against “the rogue regime in North Korea”. At the opening ceremony, he refused to engage with his North Korean counterparts. That ice, at least for the moment, would remain in place. The fact that progress is being made by both Koreas in a multi-decade conflict goes against the grain of US foreign policy. (Admittedly, this grain varies depending on mood, timing and person.) Rather than expressing sighs of relief that the two Koreas, who ultimately are the only ones who matter in any final accord, are speaking, larger powers are poking around the corner. They are the potential spoilers. For all that, the most important niggler was that of division. Soft power would be used to prize apart and isolate. Would Seoul and Washington be separated, their warm, strategic relationship cooled by the seductive advances of Pyongyang? And what of a persistently prickly Japan, locked, by virtue of security and circumstance, in an at times awkward alliance with South Korea and the United States? Pyongyang has certainly been stocking up on its soft power inventories, disseminating them in short sharp bursts. Kim Jong-un’s sister, Kim Yo-jong, supplied an ample “spear” in the “charm offensive” by attending the opening ceremony. North Korean pop singer Hyon Song-wol of Excellent Horse-like Lady fame had also been doing the rounds in the South to inspect the venue where the DPRK Samjiyon Orchestra would perform, prompting concerns that she might be a good disguise as a Trojan Horse. The Olympic moment was something of an intoxicated binge, a high point that could, in time, dissipate into depressed normality. Former senior US diplomat Douglas Paal suggested how “tough” it was “not to get caught up in the emotions of an Olympics event”. Another ally to be discomforted in this moment of diplomacy is Japan. The fact that Japan’s prime minister, Shinzo Abe, decided to grace Friday’s opening ceremony with his troubling presence raised the spectre of North Korea’s abduction of Japanese nationals. (Some 470 abductions are said to have taken place between the 1960s and 1980s.) He also proceeded to irritate his South Korean hosts by insisting that joint military drills with the US would resume immediately after the Olympics. As for Pence, North Korean soft power, at least behind the scenes, may have had its seductive effect. From icy standoffishness at the ceremony, he would say aboard Air Force Two on Sunday that the United States would be open, despite the ongoing “maximum pressure” campaign, to talks without preconditions with Pyongyang. There was the natural caveat, the now genetically programmed refrain. “The point is, no pressure comes off until they are actually doing something that the alliance believes represents a meaningful step towards denuclearization.” Conditions, without preconditions, a muddled state of affairs that will not necessarily trouble the negotiating wing of the DPRK.